I took this picture at the Vinton Fall Festival a couple of weeks ago. 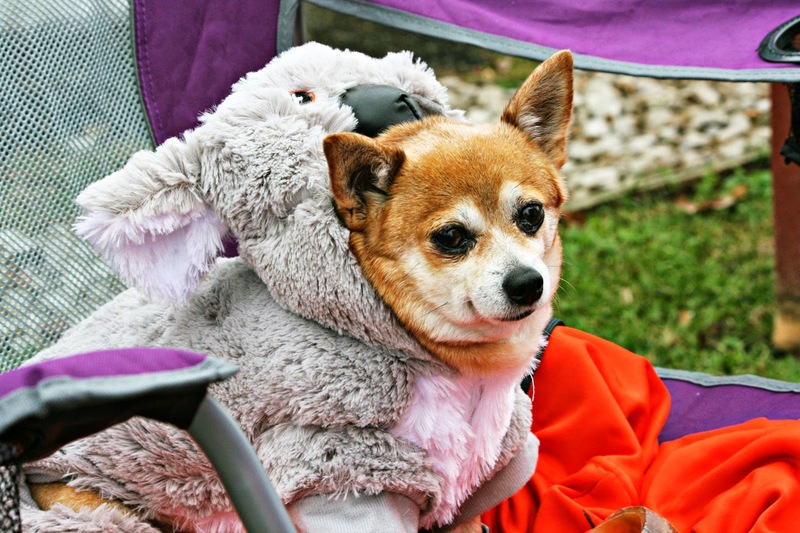 This cute little dog dressed up as a koala caught my attention. Wishing you all a Happy Halloween. Looking forward to some trick or treating this evening. Hope the boys get me some Reeses cups! Oh my goodness, you're Harry Potter's Mum......who knew?!? And a Happy Halloween to all of you too! Mom has to check all of that candy and take out the reeses as that is payment, well for being mom. I have lots of Reeces, stop by. Hope the boys have a great Halloween Lisa! My Monkeys are all dressing up as Weeping Angels (from Dr Who) and they also built themselves a TARDIS to put in the front yard. Ha! I LOVE Reese's Cups!! Have a wonderful Halloween evening. Heerlijk vooeal voor de kinderen. Just stopping by to say Happy Halloween!!!!!!!!!!!!! I love thoe too! Happy Halloween to you and your family! Pierce looks GREAT in his costume. May the ghoulies, and ghosties, and long-legged beasties, and things that go bump in the night avoid your place. May you also have lots of Reeces cups! Blessings and Bear hugs to you all! And thanks for your kind note about Sadie. From your experience, I know you understand! Chase Bird is refusing to wear a costume. Harry Potter I suppose :-). He makes a perfect Harry Potter! Hope y'all got an abundance of Reece's PBC! 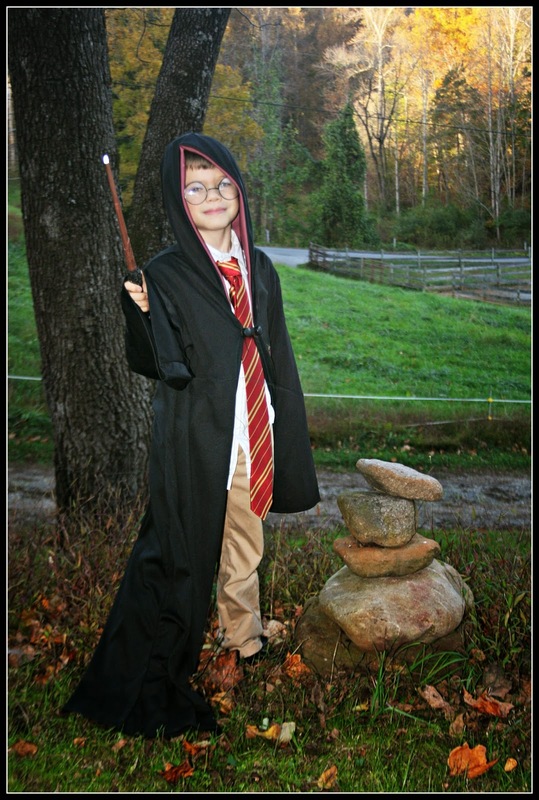 Hope Harry Potter and his friends had a wonderful Halloween! Did someone say Reeses?? My favorite! I doubt anyone did much trick or treating here. We had a freak snow storm and some brutal, cold wind. I hope the weather was great for trick or treating! GREAT Costume!! You should have come here....it was snowing and we had 10 kids total. Joe and I are sitting on a mountain of Reese's cups and miniature. Not that we are sad about that or anything. Happy belated Halloween! These costumes are precious! This is a GREAT Portrait . . .
it will be a treasure for generations, I'm sure. That's a great costume. I remember my sister dressing me up as a woman who happened to be a Gypsy. For better or worse, everyone would open their doors during Trick or Treat and say, "Oh, that's Michael!" It was all fun! I STOP BY TO SAY HAPPY HALLOWEEN TO YOU, YOUR CHILDREN, FAMILY, LOVED ONES. Harry Potter, you are a cutie! I hope you did get some Reeses cups- those are my favorite too. Well, they were..back when I could eat sugar. Boo! We got tons for Reese cup this year! I love his costume. How cute!